25th September 2018 / by Stelina W.N. Adulting is hard but if you have the right tools nothing is impossible. 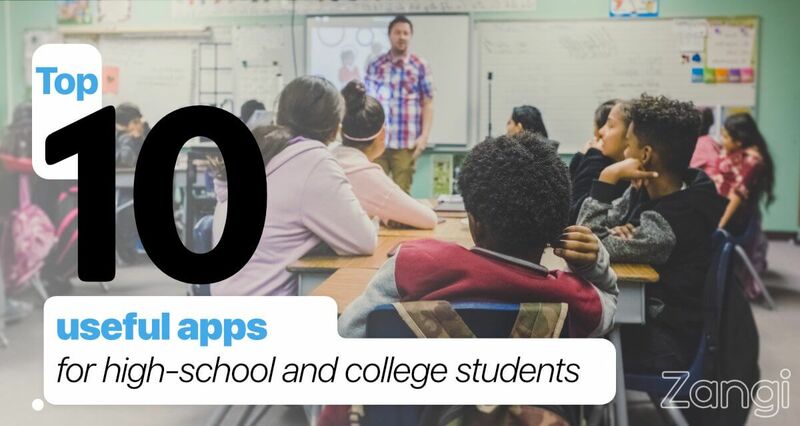 If you are a freshman and lost in the pile of duties, check out the ultimate list of top 10 useful apps and free messengers that will help you throughout your college years. One of the most important things you have to do during your high-school or college years is to find a balance between your studies and social life. It sounds near to impossible but using these apps will make you organize your day, spend less money and have a better social life. This is a must-have app for everyone, especially for students. You can write down the chunks of important information using a pen and a notebook, but instead, it’s much better for the planet Earth and your pocket to make notes using apps like Evernote. The app is pretty user-friendly and it also allows you to attach some files, links and make short and long notes. Evernote is free to download and use, but there is the paid version that allows you to synchronize all your devices. There are several reasons to have Zangi free messenger among your favorite apps. First of all, this is ideal for students because Zangi consumes several times less mobile data and is great for those who have to pay their student lawn or for those who have other expenses. Secondly, Zangi messenger app works fine no matter where you are. If your campus is somewhere far from the city and the Internet connection is pretty bad there, you still will be able to make uninterrupted calls. And, of course, Zangi is a safe and fast messenger which does not store any personal data on the servers. If you send an important message to your professor or send your graduation paper or some other important documents via Zangi fast messenger app, you can be sure no one will ever have access to them. Those of you who like being organized can use this app to track everything from your upcoming assignments to meetings. This app is also helpful for those who don’t want to keep their mind busy with random information. Instead, they can keep the numbers, deadlines and event dates here. Todoist is widely used by students and people who work at the offices and have a hectic schedule. No, you don’t need Google Maps only when you travel. If your campus is outside of your city or you took a gap year to study abroad, this is what you will need more than your books. You can pin your favorite places or your favorite library on the map and get directions to your dorm. Make sure you update the app to get the latest version of the local map with all the new cafes and hotels listed. There is also an option to download the map of the area you need and use it offline. Buying one thousand books to study the subject you want is not only expensive, but the books take a lot of space. When you live in a small dorm room or you share the space with your flatmates, space is important. The solution is to buy a Kindle from Amazon to get digital books or to use Audible. It has a variety of audiobooks, and the first book is free to download. Long gone are the days when we had to carry a flash drive to transfer our files. Now, everyone can simply create a document using a laptop and access the same document from any other device. Google Drive is a virtual space for you to keep all your important files and documents which are accessible from any device once you are connected to the Internet. So, if you ever forget your homework at home, this app will save your day. Last but not least, this app is there to save your time. You can go through the list of professors and see their rating, learn about the way they teach, read the reviews, etc.. Once you find a professor the methodology of which suits you, you can choose his or her subject for the upcoming semester. This app is for those who like working on their skills and value self-education. There are free online courses from over 100 universities available on almost every subject. You can browse and find the course you are interested in whether it’s about how to cook or how to write a code. The app is meant to gamify the process of learning a new language making it more fun and enjoyable. There are a dozen languages available if you want to start from the basics and even if you want to add more to what you already know. The app is totally free to download and use. High-school and college students usually stay up the whole night to study or they go to parties and come back late at night. If you are a student you know that keeping a healthy lifestyle while studying hard is almost incompatible. That’s why it is essential to use this app to try to control your sleep and overall health. In fact, if you are not healthy, you won’t be an effective student. As Parmy Olson mentioned, the app has ranked in the top five health and fitness apps several times. Being a student is fun, interesting and hard at the same time. But we are lucky to have all these apps and devices that make our life a little bit better and easier. Which app do you prefer and why? Let us know on the comment section below and share this list with your friends via Zangi free messenger app.